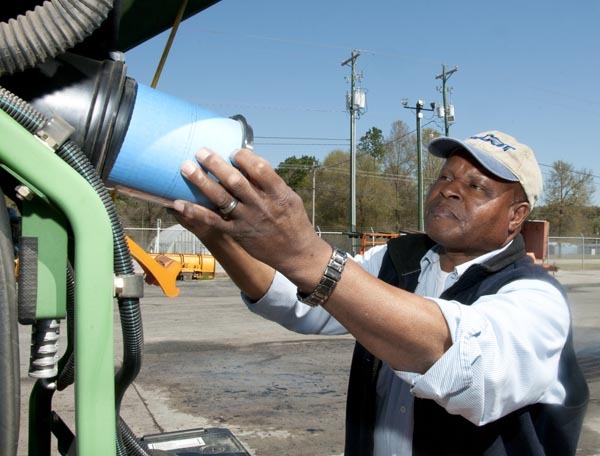 Herbert Brown checks the air filter on a tractor during a vehicle inspection before going out to trim vegetation along the highways in Colleton County, South Carolina. Brown is the vegetation foreman for the South Carolina Department of Transportation’s Colleton Maintenance Office. Let’s face it: most of the transportation photos you’re going to take involve natural light – that is, you’re going to take a picture of someone outside, working, wearing bright colors, in variable conditions. Second, be aware of the light and how it is going to affect your subject. Again, Phoblographer gives some tips on backlighting, and metering, which are essential. Lastly, (and this almost goes without saying, but we’re going to say it anyway), keep your equipment in tip-top condition. It will pay you back a thousandfold with great pictures and an easy shoot. So, get out there and take some great pictures of faces of transportation!